Left to Right: Reem Sesi, Ashley Antoon, Mona A. Paulus. June of 2017 marked the 35th year of the Chaldean Federation of America (CFA) Scholarship Program, which was changed to the Michael J. George Chaldean Scholarship Fund in June of 2014. “Due to the success of the scholarship program and the demand for additional funds, we found the need to expand the program, we hope to accomplish this by combining efforts with the Chaldean Foundation program,” said Rula Yono. The amount of money given out in scholarships varied from year to year but last year they raised $45,000 and awarded 12 scholarships. “We would score the entries and distribute based on the various levels,” said Yono. The two highest achievers won $5,000 scholarships each, the next $4,000, then $3,000 and the lowest award, was for $2,000. They gave out scholarships to high school graduates and college students earning graduate degrees. They also have scholarships for newcomers who have been in the United States for less than five years. In the early years of the event, CFA held a ceremony for all the graduates and then handed out scholarships as well. They held the event at Mother of God Church for several years before moving to the Millennium Center in Southfield. 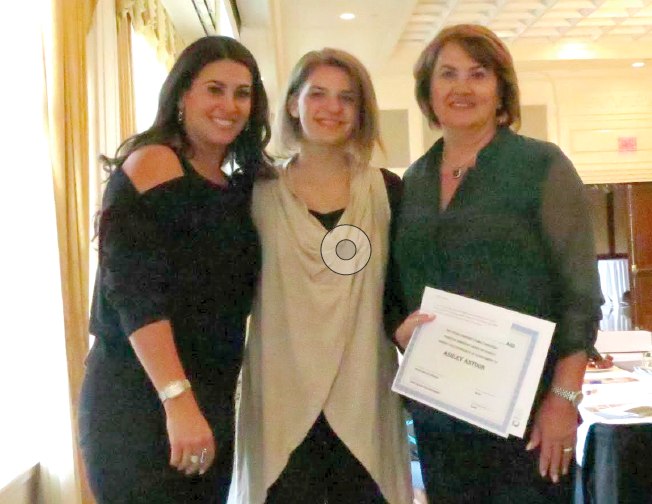 The annual event later evolved into a luncheon just for the scholarship recipients, their families and the sponsors. The luncheon was held at Shenandoah Country Club in West Bloomfield. Left to Right: Nicole Hermes, Salvin Salem, Diana George, Ashley Antoon, Joleyana Y. Hermiz, Katelin Yaldo, Isabella Antoon. In addition to possibly combining the CFA scholarship program, the Chaldean Foundation has its own academic scholarship program. The W3R Consulting STEM/STEAM Scholarship is designed to advance professional aspirations of Chaldean students across academics and vocational disciplines. The Chaldean Community Foundation’s Academic Scholarship Program is a collaborative of Chaldean philanthropies providing annual scholarship fund opportunities to students and learners. The foundation also established a fund in memory of Yvonne Nona. The Yvonne Nona Scholarship Fund will eventually provide scholarships to women in the Chaldean community. The amount of $250,000 has been allocated. Lastly, the CCF has established the Abdulkarim and Jameela Sesi Scholarship fund, established by Joseph Sesi in their honor. The fund details are still being reviewed. The amount of $100,000 has been provided for the fund. The United Family Services Chaldean American Ladies of Charity (CALC) has the Nadia Atisha and Samir A. Paulus scholarship, which is a need based scholarship. “This past year, they had 11 recipients that applied and they awarded six of them; three winners were awarded $1,500 and three winners were awarded $500,” said Diana K. George, program coordinator. “A recipient for the Nadia Atisha scholarship was Salvin Samer Salim who has exemplified extraordinary accomplishments in many areas, specifically in leadership,” said George. Salim is a 19-year-old young woman who started her leadership roles back in high school in several roles including VP of Earth Smart and Co-Chair of the service committee for national honors society. She is currently attending Michigan State University. She has a GPA of 3.5 and is majoring in Pre-Med/Psychology; she will be graduating in 2020. The recent recipient for the Samir Paulus scholarship is Ashley Antoon, 17. “She graduated from West Bloomfield High School, with a GPA of 3.7 and will be attending Oakland University this fall [and] majoring in health science, which will lead her to her dream career as a pharmacist,” said George. This past summer, the AFPD Foundation reached the highest amount of scholarship dollars ever distributed in one given year. They gave out $60,000 in scholarships in 2017 to 40 students and 12 of them are from the Chaldean community. Every year the AFPD Foundation awards academic scholarships in the amount of $1,500 to extraordinary and deserving students all throughout the Midwest who will be attending, or are already attending an accredited public college, private college or university. Scholarship recipients have an opportunity to meet and network with donors and contributors during the AFPD Foundation’s Annual Joseph D. Sarafa Luncheon. Since its inception, generous contributions have permitted the AFPD Foundation to distribute more than $750,000 in scholarship funds to the employees and family members of member businesses, their customers, and financially disadvantaged youth. Lauer’s message also included how DTE tries to be the best in the world and the best for the world. At the luncheon, he focused on the second half of the vision.